Hello Friends, I hope you are doing well! Can you believe we are already in April? It’s been a hectic year for me, but it’s been a productive one so far. I was in CA late January and taught 5 classes on domestic machine and feather quilting at Road to CA quilt show. I made really sweet friends -and want to thank everyone who took my classes. Welcome to everyone’s LEAST favorite part of making a quilt – basting! But hopefully with my methods and tips, it will be less painful of a chore for you. My #1 tip is to take your time with basting and don’t rush the process. If you have a nice and flat quilt while basting, it will make machine quilting sooo much easier!! The key to successful basting is ensuring smooth, flat layers. Today’s the day!! We close on the house and get the keys – whoo hoo!! Although we are giving ourselves some extra time to decorate before the big move, I want it to be done like NOW. But last week was very productive. I ordered a new set of couches for the living room – leather in a very pretty seafoam green that will match the blacksplash in our kitchen. 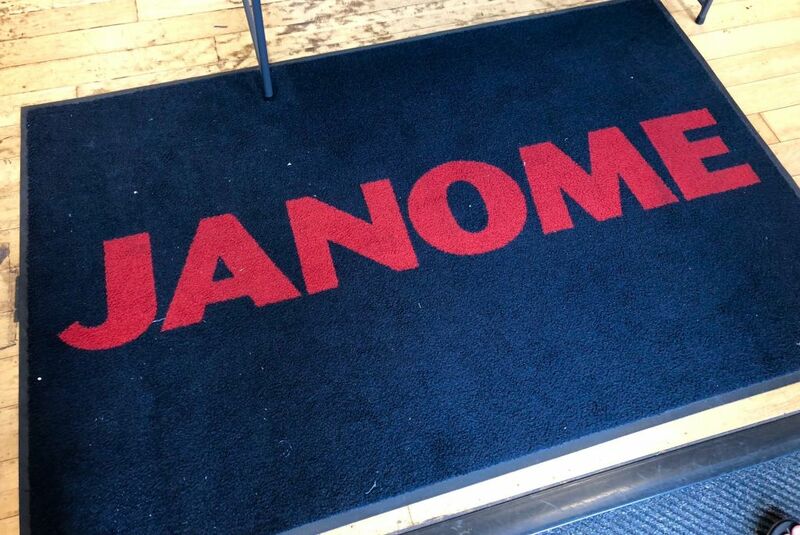 As the National Spokesperson for Janome, I decided it would be fun to start a new trend of visiting as many Janome dealerships as possible whenever I’m traveling for business or pleasure. 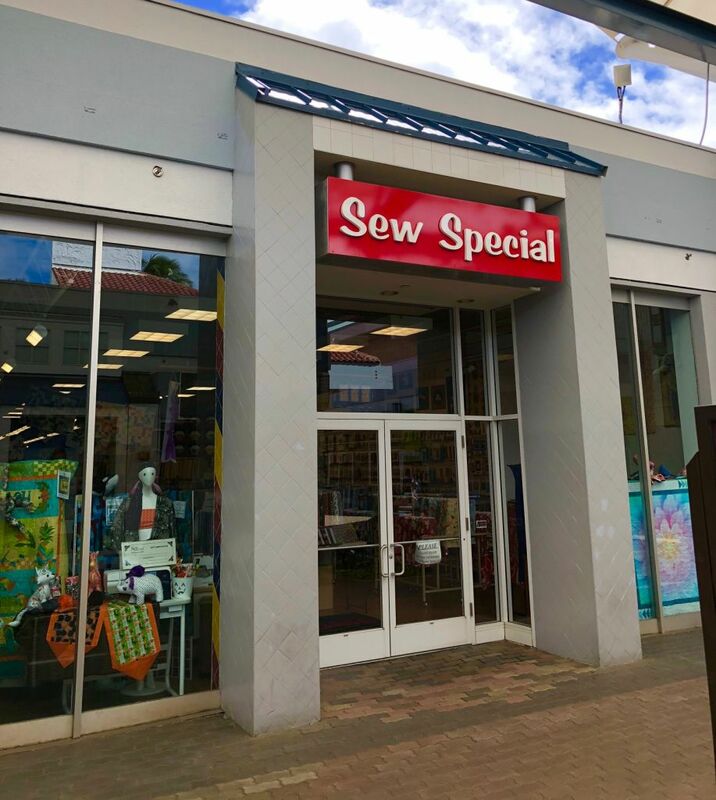 I’m going to call these surprise, drop-in visits “Janome Shop Stops.” And during our recent trip to Maui, I had the opportunity to visit a fabulous shop called Sew Special. No fabric in this week, which is just short of a miracle. There were so many interesting quilts at the AQS show that I forgot to manage my time and didn’t get a chance to shop. The YLI people didn’t vend, but I was able to find some YLI thread at the Tsuniko inks booth. That’s all I bought at the show. On the way home I found basting spray on clearance at Hobby Lobby. I’m back from the show and had a great time. I started on Wednesday with a Trish Stuart class, Creating Collages. It was a great class and she did a really good job of explaining the mechanics of collage. I learned a lot in a short time and finished my collage pear. She was the most positive, supportive teacher I’ve ever had. No change to any of the numbers. I’ve mostly done hand work this week, finishing the square with the moon and stars. The background fabric is hand painted and stamped cotton sateen. I followed the spiral shape of the stamp to embroider the moon using a linked chain stitch. So much has been going on since we returned from Alaska, that I don't know where to begin to tell the story and fill you in on our adventures. Last Thursday, I set off by myself on a four-hour drive to Susanville, CA. to teach two classes. Last week I taught a week-long class at John C. Campbell Folkschool on how to make a complete quilt from start to finish. Everyone made the same quilt from my Stepping Stones quilt pattern – but as you can see in the group pic below, they all look so different – and so fabulous! I’m excited to be teaching at QuiltCon once again February 21-24 in Nashville, Tennessee. I’ve been to every QuiltCon since it began and this will be my third time as a member of the faculty. I’m most excited about the fact that although I’ll be plenty busy teaching 3 workshops and a lecture, I’ll still have plenty of time for all of the social events, too. Click here to get the complete QuiltCon 2019 catalog. Member registration opens June 26 and general registration begins July 10. 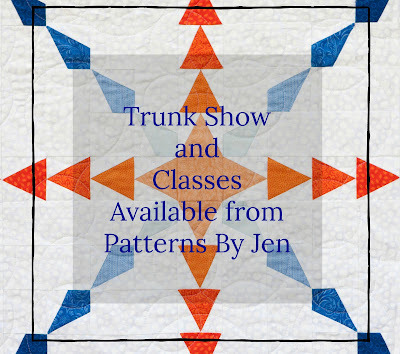 Did you know I do Trunk Shows and Classes? 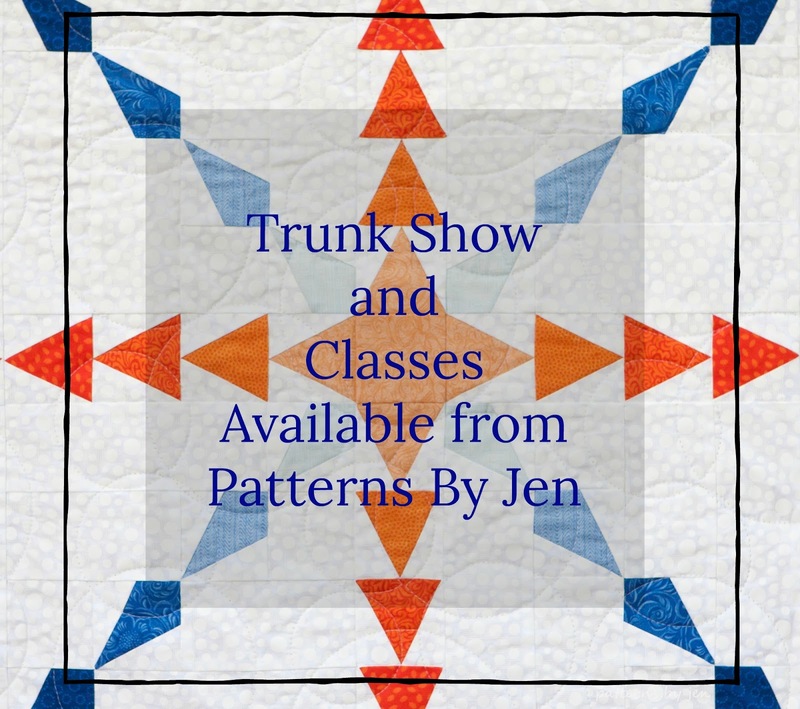 My trunk show lasts about an hour and has over 30 quilts to see. Trunk show only fee: $250 Plus travel. In May I’ll be teaching my hands on Breaking into Freemotion on the Longarm Class and I’d love for you to join me! Pantographs and design boards look stunning when quilted. 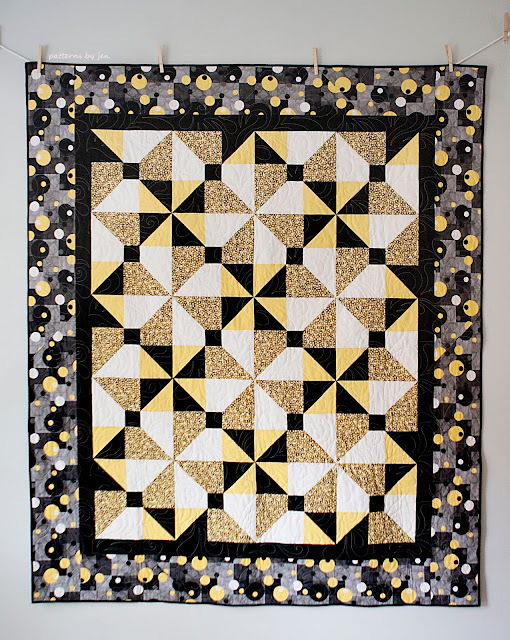 But there is a whole world of possibility in free motion quilting! The challenge is knowing where to start. Moving to the front of the machine shouldn’t be scary! Spend a couple of hours with us and play with a number of easy freemotion designs. No fabric in this week. I finished the name tag and wrapped my embroidery hoop in muslin to prevent creases for a small amount of usage. I signed up for a class at AQS Grand Rapids in August, which tripled my spending for the year. It’s unusual that most my spending this year is on classes as I take very few. The embroidery tips I put to use this week made a huge difference in my stitching. The tiny leaves are the new improved version. Click here to start a free trial of Craftsy Unlimited and watch all my classes for free!! I’m excited that the quilting scene in Las Vegas is now big enough to support two quilt shows a year! I’ll be sharing my entry results from Quilt Las Vegas soon (a show I’ve been participating in for over 20 years). But now I’m excited to be involved with the newest show, “Points West” hosted by the Las Vegas Quilters. Click here for my lecture and teaching schedule at the show. This is mainly for my Australian friends, or for anyone who wants to take a trip with me down under this September! Registration is now open for the Australian Machine Quilting Festival in Adelaide, Australia. Yep, I’m going and taking the family, too!! The dynamic mother-daughter duo went to town on their blocks. I love seeing this quilt made in blue!